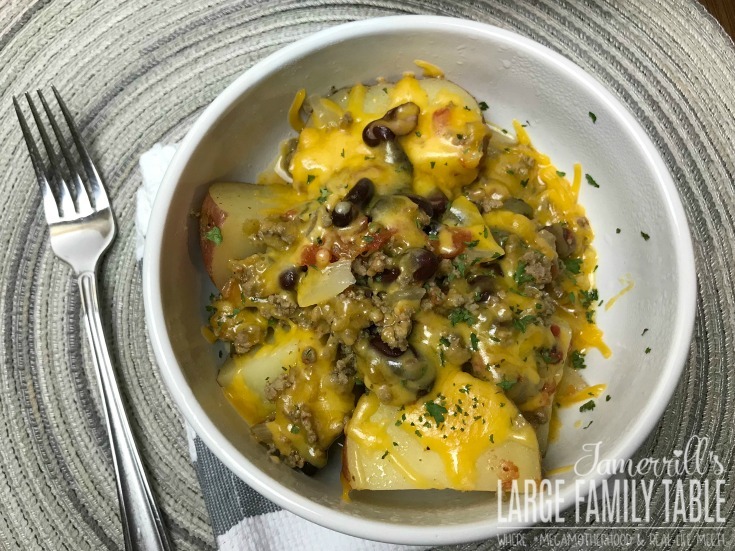 You will love this Large Family Instant Pot Cowboy Casserole! I’m a huge fan of the instant pot. 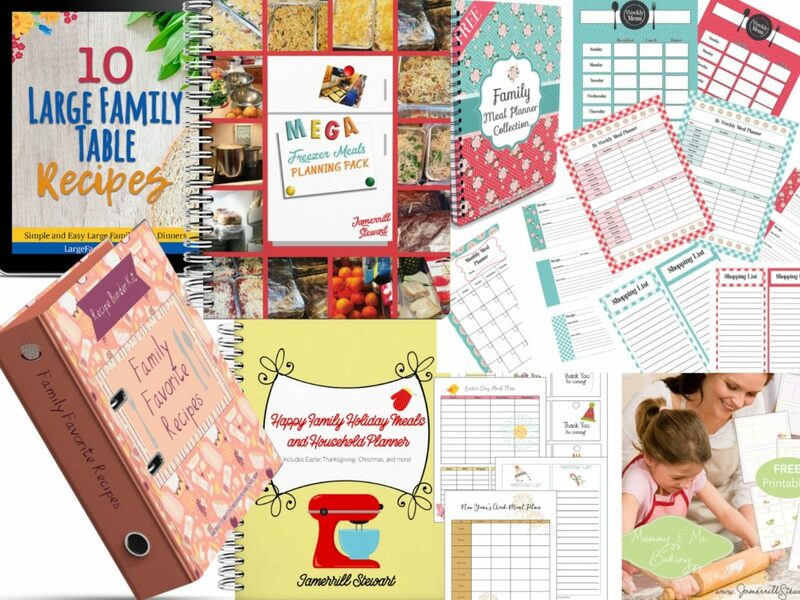 It makes cooking for my large family so much easier. I like to use my 8 qt Instant Pot or 14 qt Go Wise pressure cooker on days when I don’t have a freezer meal planned or time to prep and cook fresh at the moment (which is almost every day, ha!). The pressure cooker makes cooking dinner go much quicker than traditional stove-top cooking making it perfect or busy moms like you and me. To prep this meal, you’ll need to brown some ground beef and chop some potatoes and onions. Then, you just toss everything in the Instant Pot, get it started, and let it go. You know I like to have big batch ground beef already cooked up and ready to go in the freezer. This is the perfect meal to throw in thawed precooked ground beef! 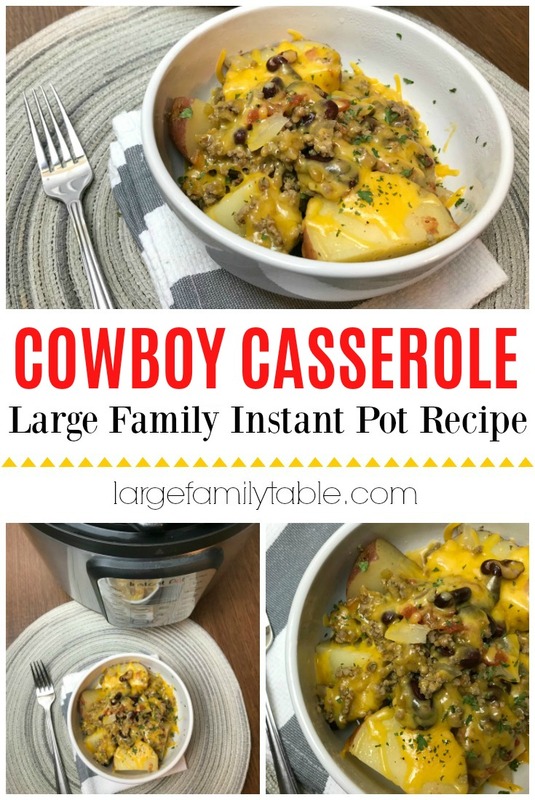 Your family will love this hearty Cowboy Casserole that comes together in your favorite large size electric pressure cooker! 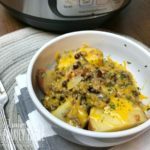 I use my 8 qt Instant Pot or 14 qt Go Wise Pressure Cooker for this recipe. This recipe requires the pot in pot method. If you do not have a pot to place inside the pressure cooker pot, create a sling using aluminum foil. Add the minimum required amount of water to the pot liner of your pressure cooker. Add the trivet and sling (or inner pot). To the sling, place potatoes using salt and pepper to season well. Top with onion, cooked ground beef, beans, tomatoes, and seasonings. Add 1/4 c. water over the top of the casserole. Cover the instant pot and set the valve to sealing. Cook on manual or pressure cook setting for 30 minutes. Carefully use the quick release to depressurize the cooker. Cover with cheese and replace the lid until melted. Serve. Cook’s Note: Remember that potatoes need a lot of seasoning to avoid a bland dish. Potatoes are filling, and meat is packed with protein. Cheese, of course, makes everything even tastier. SLOW COOKER DIRECTIONS You could make this a slow cooker recipe by adding everything but the cheese to a slow cooker and cooking on high for 4 hours. Top it with cheese before serving. Click here for more large family Instant Pot recipes! 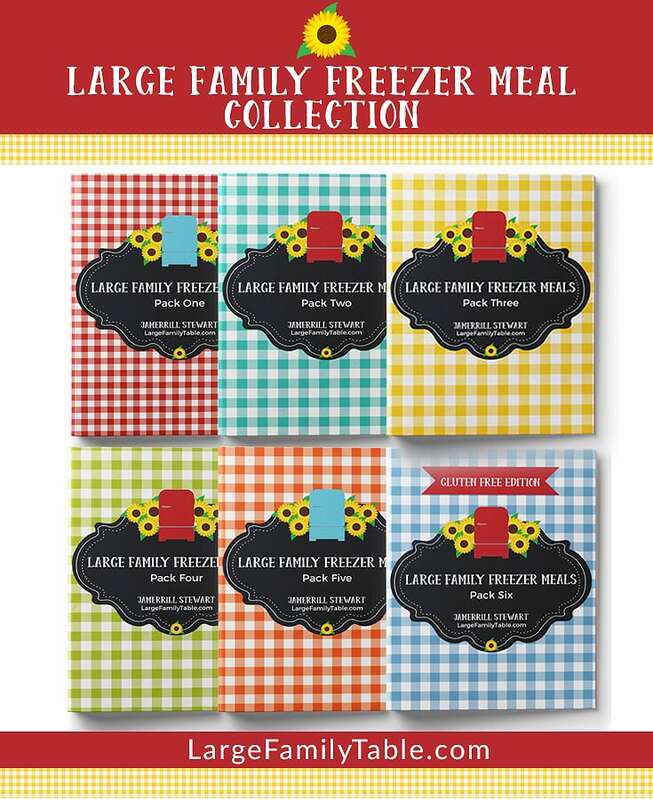 DON’T FORGET to snag your FREE Large Family Food Collection right here! You won’t believe all the mega food goodness I’m giving you! Woot! !